The Book Life: Rockstar Book Tours: Thornhill Blog Tour interview w/ Kathleen Peacock + Giveaway!! 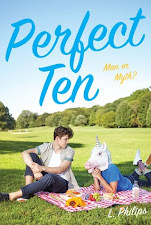 Rockstar Book Tours: Thornhill Blog Tour interview w/ Kathleen Peacock + Giveaway!! Today I am so excited to be bringing you a stop on the Thornhill Blog Tour! 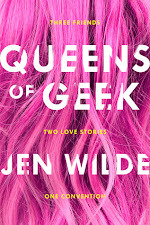 We've got all kinds of info about the book and where to find it, an interview with Kathleen Peacock herself, and an awesome giveaway!! Kathleen Peacock spent her teen years crushing on authors and writing short stories about vampires. She put her writing dreams on hold while attending college, but tripped over them when office life started leaving her with an allergy to cubicles. 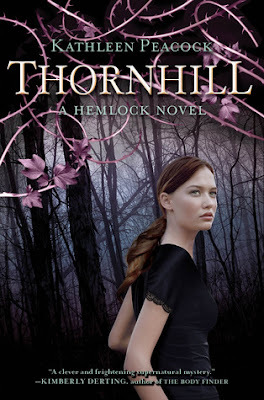 Her debut, HEMLOCK, is coming May 8th, 2012 from Katherine Tegen Books, an imprint of Harper Collins, and will be published in the UK under the title DEADLY HEMLOCK from Simon and Schuster Children’s Books. How is writing a sequel different from writing the first book in a series? In some ways, writing a middle book is much trickier—at least it felt that way with Thornhill. You need to provide a recap of what came in the first book without turning pages into info-dumps. Characters need to evolve while still leaving plenty of room for growth in the next volume. Some plot and relationship threads need to be tied off while others need to be carried over. It's a bit like walking a tightrope. Even just figuring out where to start seemed harder. I think I wrote about five or six different openings for Thornhill before feeling like I had one that finally worked. When you were first writing Hemlock, did you already have the whole series planned out in your head, or does it come to you as you are writing? Even though I tried to write Hemlock so that it could stand on its own, I was really hoping an agent and publisher would be interested in a trilogy, and so I planned out chunks of the story for books two and three in my head. After Hemlock sold (as a trilogy—yay! ), my editor suggested moving some of the subplots from book one to book two. When I did that, other things had to shift and change. Also, when I actually began to write Thornhill, I realized that some of my initial ideas (like telling the book from Kyle's POV and certain subplots) just didn't work on the page. Changes I made to Thornhill, ended up rippling over into book three. After everything that happened to her and the people around her in the first book, what kind of Mac can we expect to see in book two? In some ways, Mac is a little more open in Thornhill. Admitting she had feelings for Kyle—actually saying she loved him—was a huge emotional step for her. In book two, Mac is also forced to stop outrunning her childhood and deal with her past. In order to save the people she cares about, she'll have to put old grudges aside—something she's not sure whether or not she can do. Can you tell us anything about camp Thornhill? Since Mac and Kyle are trapped inside, will we get to see other character POV’s from outside of the camp? As tempting as it was to break POV—and there were times when it was very tempting—book two is told entirely from Mac's perspective. Thornhill isn't like other werewolf rehabilitation camps. While the other camps have no actual intention of rehabilitating the infected, life at Thornhill is actually designed around trying to help the inmates learn to control their wolves through a series of behavior modifications, self-control classes and harsh punishments for anyone who falls out of line. Like cattle, we were forced off the truck and counted before guards in blue uniforms took over and herded us across an expanse of pavement. They carried guns that looked every bit as dangerous as the ones the Trackers were toting and made sure no one made a run for it. Not that there was any place to run to. We were in a courtyard behind a massive gate. A thirty-foot-tall fence topped with razor wire stretched out from either side of the entrance and disappeared into the dark. It was easy to imagine that it went on forever. Serena tilted her head to the side. "It's electric," she murmured. Thanks so much Kathleen. I cannot wait to read Thornhill! This book looks and sounds so good!! Thanks for the giveaway! !